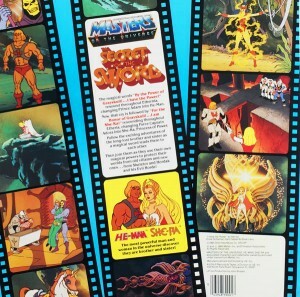 A rigorous romp through three soundtrack albums from the Filmation/Mattel phenomena that spawned three TV series, two feature films and vast toy aisles. Released in 1985. Narrator: Peter Fernandez. Producers: Lou Scheimer, Arthur Nadel. Co-Producer: John Braden. Writers: Larry DeTillio, Bob Forward. Music: Shuki Levy, Haim Saban, Erika Lane (Scheimer). Conductors: Haim Saban, Shuki Levy. Running Time: 37 minutes. Song: “I Have the Power” by Erica Lane, Haim Saban, Shuki Levy. Soundtrack Dialogue Voices: John Erwin (He-Man/Prince Adam, Beast Man); Melendy Britt (She-Ra/Princess Adora, Catra, Hunga); Alan Oppenheimer (Skeletor, Man-At-Arms, Cringer/Battle Cat, Bald Rebel, Chef Alan); Linda Gary (Teela, Queen Marlena, Sorceress, Shadow Weaver, Glimmer, Madame Razz); George DiCenzo (Bow, Hordak); Erika Scheimer (Queen Angella. Imp, Vocalist); Lou Scheimer (King Randor, Swift Wind, Kowl, Manenna, Broom, Sprag, Sprocker, Gary the Innkeeper, Bard, Messenger, Horde Computer); Noam Kaniel (Vocalist). In the 1960’s, a hue and cry went up when certain groups became peeved that network children’s TV shows were being used to sell things to kids. The biggest offenders seemed to be the shows with characters that started as toys. This controversy brought the curtain down on shows like ABC’s Hot Wheels and also prevented cartoon characters from appearing in commercials during their shows. Meanwhile, daytime TV syndication was taking hold as sitcom reruns, classic cartoons and a few made-for-daytime programs took hold. Two decades later, before cable had made cartoons a 24-hour offering, syndication still offered advertisers a sizable youth segment. 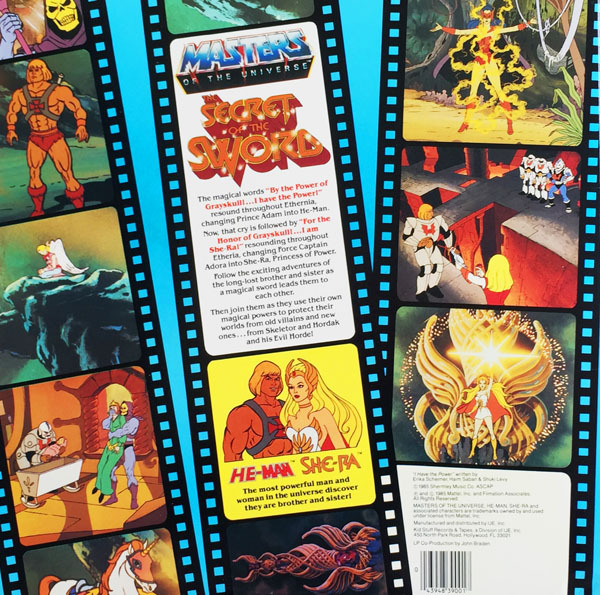 Syndication was not subject to the same content pressures as networks, so Filmation and Mattel (who had also developed Hot Wheels) combined forces to create He-Man and Masters of the Universe. Mattel brought an ability to play-test with groups of children to make each character meet their specifications. Filmation drew upon the proven talents of their artists and writers to make the show as appealing as possible. It was a calculated business scheme, but not without sincere intentions among those creatives assigned to make both the products and cartoons as good as possible given the time, money and creative parameters. That observation is borne out of the bonus features on the DVD collections, in which the writers explain their thought processes behind each and every episode. From their standpoint, telling a good story was the goal and merchandise was not their issue. Whatever the intentions, there were no assurances that producing 65 half-hour episodes at a rapid clip and rolling thousands of toys off assembly lines was going to work. But it did succeed, beyond anyone’s expectations. 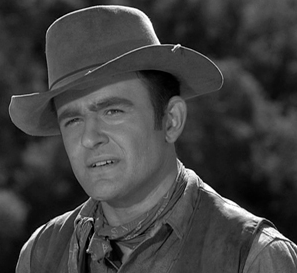 A second season was produced, followed by this feature film, which was actually a combination of five episodes created as separate shows. The Secret of the Sword was a pilot film, released to theaters to drum up excitement for She-Ra, Princess of Power. The film—and the episodes—introduced new characters, a second universe of storylines, and widened the marketing segment for toys. If any of this inspires a scoff or two, it might be worth noting that the shows feature some highly accomplished voice actors. No one was more surprised than John Erwin when Lou Scheimer asked him to play the lead, after years of supporting Filmation characters like Reggie Mantle on the various Archie series (he was also the voice of Morris the Cat in the Nine Lives Cat Food commercials). For the dual characters of Prince Adam and He-Man, Erwin employs a vocal shift much as Bud Collyer did for Clark Kent/Superman—plus Erwin had already served Filmation well with his skills in voicing multiple roles. Two TV revivals of Masters of the Universe and a live-action feature film tried to duplicate the breakout success of Filmation’s bonanza, but even Filmation could never make the lightning strike twice. However, the door flew open to a new age of first-run animated daytime TV shows—from Disney, Spielberg and others–with more fluid animation and creative levels that are still impressive. Kid Stuff released a full line of He-Man and She-Ra story and song albums and read-alongs, but this record is the only one with soundtrack voices. Another plus is the narration of Peter “Speed Racer” Fernandez, whose presence suggests that the production work for the album may have been done in New York instead of Florida. This song was played over the closing credits of the feature, but it is only heard in stereo on this Kid Stuff album. Released in 2015. Reissue Album Producers: Neil S. Bulk, John Takis. Executive Producers: MV Gerhard, Matt Verboys. Associate Producer: Dan Goldwasser. Digital Music: Shuki Levy, Haim Saban, Erika Lane (Scheimer). Conductors: Haim Saban, Shuki Levy. Liner Notes: John Takis. Transfers: Johnny Dee Davis. Mastering: Stephen Marsh, Fernando Lee. Production Assistance: Frank K. DeWald, Mike Joffe. Art Director: Dan Goldwasser. Running Time: 131 minutes. 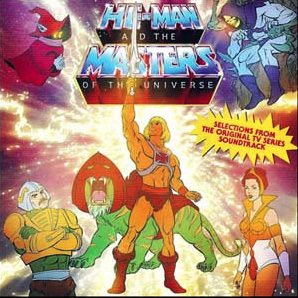 Bonus Tracks: “He-Man (Main Theme)” (No Vocal), “Book-Man” (Alternate Ending), “Bad Attack” (Alternate Ending), “Flash Chase” (Alternate Ending), “Dragon’s Eggs” (Alternate Ending), “Circus Parade” (Alternate Ending), “Beast Man and Skulls” (Alternate Ending), “Meditation” (Mono), “Teela’s Theme” (Mono), “Run, Orko, Run” (Mono), “Facing the Castle” (Mono), “Royal Family” (Mono), “Orko’s Time Machine” (Mono), “He-Man” (Main Theme in Spanish – Sung by Memo Aguirre). For fans of Filmation or television animation in general, to have a collection of soundtrack music cues and themes can be considered quite a wonderful thing. Haim Saban and Shuki Levy wrote the music (with Scheimer’s daughter Erika), after creating similar scores for Inspector Gadget and other DIC shows, and before Saban started his own company. Before He-Man, Filmation’s main composer was Ray Ellis (who arranged many a hit for such singers as Johnny Mathis and Tony Bennett)—and it sure would be great to see some of Ellis’ cues get equally grand CD treatment, including liner notes as informative as the ones in this album, written by John Takis. The music recalls the Filmation audio style, just as the series visually sustains the Filmation house “look” (right down to Madame Razz’s broom, which looks just like the Talking Signpost in Filmation’s seminal feature, Journey Back to Oz). Watching the shows one after another, the music cues are repeated so often that it makes one believe there are only a small handful, but as this album proves, there are many of them (though some are played more frequently than others, to be sure). Some of the cues make for pleasant listening on their own, especially the mellower ones. The He-Man and the Masters of the Universe 30th Anniversary DVD Box Set, which contains all the Filmation shows, a selection from the second series and the complete third series as well as a generous supply of special features, there is a bonus single audio disc with the stereo background music also included on this new two-disc release. The theme songs on this album are in mono, while they seem to be stereo on the earlier disc. However, the two-channel effect may just be a very effective simulation. This is the stereo-sounding version from the CD that was packed in the 30th Anniversary DVD Box Set. It has no vocals, so the music is allowed to be heard more fully. Surprised that they didn’t complain about Mattel was also a sponsor for Matty’s Funday Funnies (season one had the Harveytoons and season two had Beany and Cecil) back then in the 1960’s. Fast forward to the 1980’s when He Man, She Ra , Monchichis, Transfomers,G I Joe, My Pet Monster My Little Pony and even Rubik’s Cube and the poorly scripted Lazer Tag Academy were based on those popular toys and games and that was when another group of idiotic parents and watchdog groups who claimed that the cartoons were actually “one hour commercials”? (Fact is many of these cartoons were actually a half hour long.) Even the Care Bears,Rainbow Bright,Shirt Tales (who were based on greeting card characters) and The Smurf (who are a popular Belgium comics series) were victims of the watchdog groups even though The Smurfs nearly lasted a decade on tv. 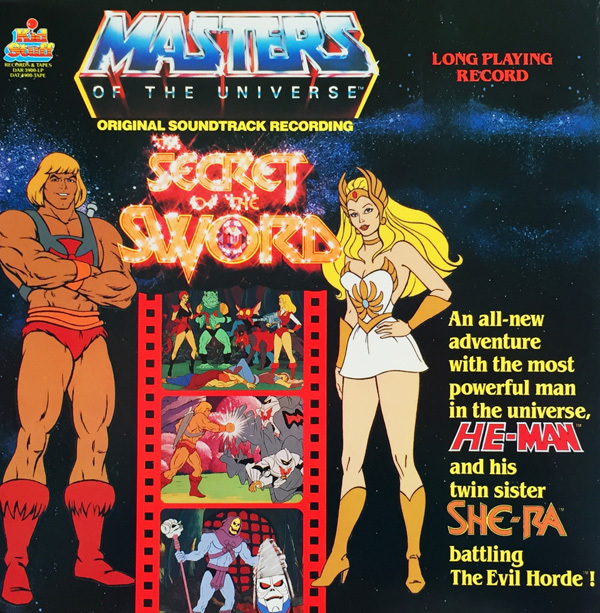 Anyhow surprised that how Orko (He Man) and Loo-Kee (She Ra) weren’t one the He Man/She Ra The Secret of the Sword record (even though in my and everyone opinion) were the two most unpopular characters that were on He Man/She Ra. I sort of joke that if DreamWorks makes a deal with Mattel on doing an new animated series with toy line (part of me, for some dumb reason, wants to see this happen), Orko should be voiced by Katzenburg himself (he keeps saying celebrities are funnier voice actors and he is considered a celebrity, so let’s see him do that). Actually, I want this to happen just to have Jeff learn a lesson on voice acting. Ray Ellis’ Filmation cues were credited under the name of his wife, Yvette Blais (and co-credited to “Jeff Michael,” a pseudonym for Norm Prescott). By the way, on the cover for “The Secret of the Swords” album, where’s She-Ra’s cape? I am still suprised that Mattel did not sue Gary Goddard over the Skeleton Warriors. Goddard directed the live-action He-Man movie and Skeleton Warriors seemed like an animated adaptation of the movie. I’ve never been a fan of these shows, but the CD and DVD box sets sound intriguing–makes me wish so hard that “BEANY AND CECIL” got this treatment, even sharing with us some of the oddball music cues that were sampled throughout the series, and there were some unique ones, believe me, even one that I actually heard piped through a Mexican restaurant one year in California! So, hey, more power to ya, because you’re getting the respect I wish my favorite cartoons were getting these days! Oh, and I agree about the voice talent. These kinds of shows worked specifically because of some of the voice over talent that gave flesh and blood to the characters…the same goes for the characters that I cherished, both in theaters and on television. The Power of Point Dread book and record also had some pretty good background music too, and I don’t think it was used in the series. For He-Man, Saban and Levy recycled previous cues from their Mysterious Cities of Gold score which was partially released on vinyl and later more fully presented on two French cds. It is now long out of print and deserves another pressing. Ray Ellis’ Spider-Man cues need a legitimate release alongside the stock cues used in both Spider-Man and Doctor Who in the (somewhat) contemporaneous Hartnell period. Another cartoon composer who like Saban and Levy has seen a recent revival of interest is Johnny Douglas who scored Transformers/GI Joe. His Spider-Man music is incredible and needs to see the light of day, and it is miles ahead of his Hasbro scores. Douglas self-released a newly recorded 45 of his Spidey theme with and without lyrics(!) and an accompanying piano score, but his actual cues need a release. The Power of Point Dread book and record also had some pretty good background music too, and I don’t think it was used in the series. 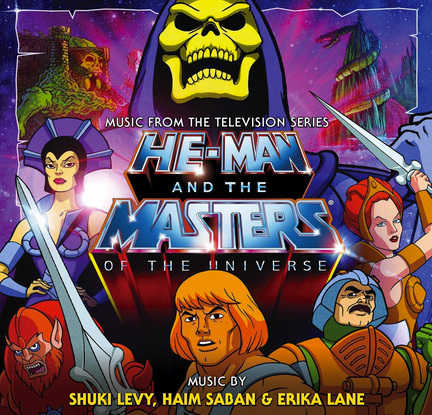 For He-Man, Saban and Levy recycled previous cues from their Mysterious Cities of Gold score which was partially released on vinyl and later more fully presented on two French cds. It wouldn’t surprise me they did that to save on writing new material. Let alone from a show the US wouldn’t see for another couple years. It is now long out of print and deserves another pressing. I’m sure it all does! Ray Ellis’ Spider-Man cues need a legitimate release alongside the stock cues used in both Spider-Man and Doctor Who in the (somewhat) contemporaneous Hartnell period. Another cartoon composer who like Saban and Levy has seen a recent revival of interest is Johnny Douglas who scored Transformers/GI Joe. His Spider-Man music is incredible and needs to see the light of day, and it is miles ahead of his Hasbro scores. Douglas self-released a newly recorded 45 of his Spidey theme with and without lyrics(!) and an accompanying piano score, but his actual cues need a release. America has never really caught onto the idea of releasing such material on LPs/Cassettes/CDs as some other countries do (especially Japan). France and Italy used to crank out a lot of 45’s and LP’s to many cartoons as well. America just never really saw a use for release even theme songs to popular cartoons then. Advertising and violence were the two criticisms by the same parents who cartoon fans had afar butted heaeds with, yet there was also My Little Pony,Care Bears,etc.which weren’t violent but still selling toys….. It was a sad shame that a basically low rate (in my humble opinion) studio was the only one using Technicolor. Oh yeah. And domestic American animation…..
Nobody gave two s–ts for MLP (besides the nutty Christian groups). Well, at least they knew where to put their money at. Surprisingly My Little Pony (2) G I Joe (2), Care Bears (2) He Man (2) and Transformers were brought back to tv (MLP 1990’s & MLP-FIM 2010, G I Joe (2010’s) Care Bears 2000 the DiC remake with the “Borg Bear” like villain called Grizzor and another short lived version that aired on the Hub now Discovery Family Channel, He Man 1996 Parafrance’s version and the Mike Young remake of 2000 showing a younger prince Adam) but the most successful of them all was the Transformers with several version (many from the 1990’s that aired on Japanese tv and I’ve seen on XHGC 5 via big dish satellite with the opening credits in Japanese and the closing credits in English with the instrumental version of the Transformer theme from the 1980’s ) as well as a successful movie franchise . It has no vocals, so the music is allowed to be heard more fully. Aside from “HE-MAN” sung out during it, there wasn’t any real lyrics to speak of besides Adam/He-Man doing the introductory monologue. In some countries though, that sometimes got a different treatment altogether. For example, the tune saw a 45rpm release in Latin America with lyrics sung by “Capitán Memo”, who seemed to have became quite popular with having performed theme songs to all sorts of Japanese cartoons shown down there. The version with Spanish lyrics is included on the CD set, too.